The pilgrimage will visit the holy places where Buddha lived and taught. We will begin in Kathmandu, Nepal where we will visit Boudhanath Stupa, Swayambhunath Stupa, Namobuddha Stupa and Mahabuddha Stupa (Temple of the Thousand Buddhas). 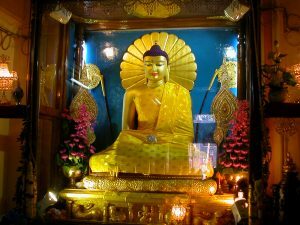 We will visit the Buddha’s birthplace, the site of his Enlightenment, the actual locations where he taught, the Turning of the First and Second Wheels of Dharma, and Kushinagar where he passed away at the age of 80. We will also see many other important places in the Buddha’s life story and the lives of early Buddhist disciples. In addition to Lumbini, Bodh Gaya, Sarnath and Vulture’s Peak in Rajgir, visits will include the ruins of Nalanda University, where Nargarjuna, Aryadeva and many others studied and taught, and Pharping, where the Vajra Yogini Temple and the Guru Rimpoche Cave are located. The trip will conclude in New Delhi. The price is all inclusive (lodging, meals, and local transportation) within Nepal & India from December 4th through December 16th, 2016. The price includes a donation of $1000 per person to the Jewel Heart Organization, that is tax deductible to the extent permitted by your tax law. The price for “Footsteps of the Buddha’s” Pilgrimage in Nepal & India package does not include International airfare. All participants are expected to purchase their own health insurance and trip cancellation insurance, and will be asked to sign a tour deposit waiver.